Thinking of exploring another distinct area of New Orleans? The Gert Town neighborhood is an often overlooked slice of history nestled into the fabric of a diverse city. As the home of Xavier University of Louisiana and small local businesses, the neighborhood has slowly become redeveloped several years after the aftermath of Hurricane Katrina. While the neighborhood has had its share of hardships, it’s history is a unique introspect into the history, politics, and culture of the city. Let’s explore the background of this place, home to working people who help make up the soul of the city. A general consensus relates that the name Gert Town was derived from Gehrke’s Town, a leading general store located in the neighborhood at Carrollton and Colapissa streets around the turn-of-the-century. As a local gathering place, it housed the area’s only telephone at the time. In 1900, The Tulane St. Charles Belt streetcar line was established and it passed through the Gert Town section on Carrollton Avenue. The route helped establish development in the area. By 1902, the public Lincoln and the adjacent Johnson Parks were popular gathering spots for African Americans in an era where public spaces were racially segregated. Both these parks featured skating rinks and balloon ascent exhibits. It also served as a popular dance space which featured singers and musicians like the notable Buddy Bolden and Bunk Johnson. Today, visitors will notice an old, winding street pattern which was developed around the bends of the Mississippi River. As the neighborhood’s elevation is much lower than other areas, it was often referred to as the swamp “back of town” section. In the past, major streets would end before entering the area. After a limited amount of residential development in the late 1800s and early 1900s progressed, the older Uptown streets that run perpendicular to the river met in the Gert Town and Mid-City sections. During this time, many side streets were unpaved than those in surrounding neighborhoods. The small section of the city was also more isolated than other areas because of the New Basin Canal, located where Interstate 10 stands today. Gert Town has often been identified as an overlooked neighborhood of New Orleans. 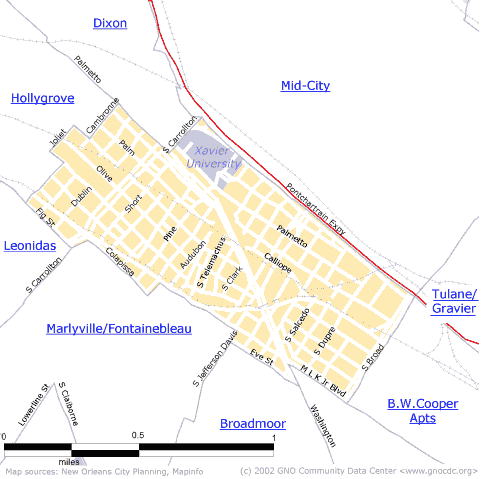 During Hurricane Katrina, Gert Town was significantly flooded due to its low-lying altitude. However, certain sections like thoroughfares along Jefferson Davis Parkway and Carrollton Avenue went largely unscathed. Although recovery remained slow, the neighborhood is getting back on its feet. Today, Gert Town is a designated as a strategic zone of the city that is to benefit from redevelopment and community reinforcement and engagement. There are many old, famous architectural buildings that harken back to the working class days of the mid-19th century to check out! In addition, there is a diverse range of small ethnic restaurants and bakeries that are hidden treasures in the neighborhood. As Gert Town continues to undergo community engagement and redevelopment, make sure to support these local businesses and the people that call this community home. Enjoy the sights housed in an area that is one of the touchstones of NOLA’s community, and wander hidden streets in this small, tucked away section of New Orleans.